AUGUSTA -- Sean McNally said his competitive fire is gone, that it dried up and blew away as soon as the University of Maine men's basketball team ended the 2010-11 season with a loss to Hartford in the first round of the America East tournament in March. AUGUSTA — Sean McNally said his competitive fire is gone, that it dried up and blew away as soon as the University of Maine men’s basketball team ended the 2010-11 season with a loss to Hartford in the first round of the America East tournament in March. But it only took a few minutes, a few trips up and down the court at the Kennebc Valley YMCA, and the 6-foot-7 McNally starts feeling it. First, he sank a 3-pointer on his first shot of the game. Then, he blocked a shot at the other end. McNally took the ball from one end to the other, making a layup. Midway through the first half, when McNally got the ball as he cut through the lane, he planted a two-handed slam dunk, you can tell. It’s just a men’s league game, but it drew the competitive spirit in McNally out of hibernation. “Once I step on the court, it becomes competitive, I guess,” McNally said. 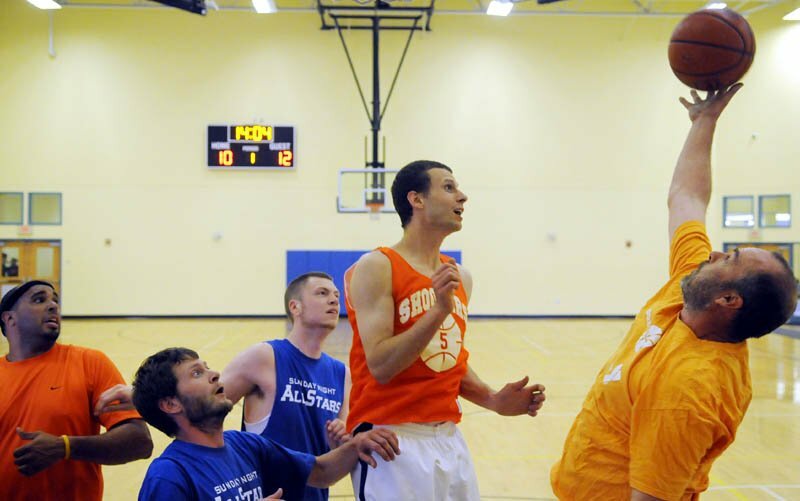 The men’s league at the Kennebec Valley YMCA is just another recreational league, but this summer, it’s attracted a number of talented players, many with college basketball experience, and that’s kicked up the competitive level a notch or two. McNally, who started 28 games for Maine in a senior season slowed by injury, is just one of the league’s players with college basketball experience. There’s Nick Pelotte, a Valley High School graduate and a Division III All-American at Plymouth State University; Josh Berard, a Lawrence graduate who played at Central Maine Community College; Travis Dorsey, a Lawrence and Thomas College alum; Maranacook’s Kaleb Violette (CMCC); Erskine’s Matt Donar (University of Southern Maine); Winslow’s Adam Haskell (Maine Maritime) and Martin Cleveland, who played for Deering High School and Husson, and will play at Thomas next season, to name a few. The league is the work of Craig Cameron. A 2004 graduate of Cony High School, one of Cameron’s goals when he became the KV YMCA’s program director earlier this year was to rebuild the men’s rec basketball league. Cameron, himself a player in the league, reached out to guys throughout central Maine he played with and against in high school, as well as other players in the region. Cameron managed to pull together a six-team league that plays every Wednesday night. Games are two 20 minute halves. It’s running time, until the last two minutes of each half. The season will culminate with all six teams taking part in a single-elimination playoff, with the championship game at 6:30 p.m. July 27. Following the championship game, there will be an All-Star game, with three players from each team selected to participate. All games are officiated by board certified referees, Cameron said. “I want to move this right into winter and add three or four more teams,” Cameron said. Berard, who ran the league “six or seven years ago” said Cameron did a good job pulling in so many good players. “It’s really competitive. A lot of teams have quick guards and skilled big guys,” Berard said. Berard would like to see the league grow even more. This past Wednesday, Berard’s team, the Sunday Night All Stars, played like a team that’s been together for years. In some ways, it has. It’s a collection of some of the best players from Lawrence over the past decade or so, along with former Skowhegan standout Derek Holt. One fast break was executed perfectly, with the ball going from Nate Lambert to Dorsey to Holt, never touching the floor once the team crossed midcourt. “Six guys on this team, I played high school ball with,” Berard said. It’s for fun, but nobody who comes Wednesday night after Wednesday night want to lose, either.